Mojix will be showcasing solutions that help retailers and brand owners digitally transform their supply chain and operations so they can seamlessly operate in the on-demand world of omni-channel fulfillment. Accurate item level data is the foundation for retailers who want to improve process and merchandise optimization, increase sales and conversion rates through customer engagement, authenticate goods, and achieve omni-channel excellence. 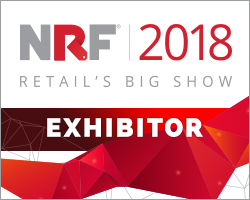 Mojix, Inc., a leading provider of item chain management solutions for retail will be exhibiting at the National Retail Federation (NRF) Big Show in New York City on January 14-16 at the Jacob K Javits Convention Center. This year, Mojix will be showcasing solutions that help retailers and brand owners digitally transform their supply chain and operations so they can seamlessly operate in the on-demand world of omni-channel fulfillment. Located on Level 1 in booth #542, Mojix will feature RFID, IoT and blockchain solutions that enable item level digitization and automation of the retail supply chain and in-store operations in real time, giving retailers and brand owners the ability to transform data streams into actionable business intelligence. Accurate item level data is the foundation for retailers who want to improve process and merchandise optimization, increase sales and conversion rates through customer engagement, authenticate goods, and achieve omni-channel excellence. Mojix will also be highlighting item level digitization and automation of the retail supply chain in real time using RFID and pushing this data to Microsoft Azure blockchain services with retail partner The Shoe Box. This enables improved merchandise visibility and in-store chain of custody applications for the informed shopper. The solution will be demonstrated at the Microsoft booth on level 3, #2803. The National Retail Federation (NRF) 2018 Show, aka Retail’s Big Show, is a showcase for the industry’s most innovative technologies and the place to be for retailers. NRF welcomes retail executives from all around the world who are searching for the most innovative and modern solutions and tools. Mojix is proud to exhibit at this year’s convention. Mojix provides item chain management solutions for the digitization and automation of supply chains in real time using RFID and blockchain technology. Our primary focus is solving the big data problems created by collecting large-scale amounts of data from various wireless and wired sources. We are innovators in fixed infrastructure sensor networks that collect, store, analyze and interconnect data from multiple sources including RFID, GPS and other sensor devices. Mojix solutions provide big data scalability and feature highly configurable application frameworks and elegant user interfaces with advanced analytics, enabling end-to-end business intelligence and data visibility across multiple industries. For more information, visit http://www.mojix.com.